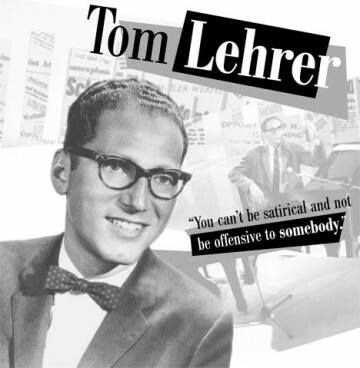 Happy Birthday, Tom Lehrer | Indigenize! My first blog post for HAHABUDA was on him. He’s far too unknown for how genius he is. One of the all time great warped minds of the 20th. And by the way, Coyote isn’t the one in charge. he just runs P.R. Loki is the one yer after. I hear Anansi is his number 2. Poisoning Pigeons & I Hold Your Hand in Mine. Even I realized that the Masochism Tango would be a bit much. I do a whole Poisoning Pigeons presentation for Spring in my classroom each year. LOVE TL! Margarita, your jr.high students must adore you! How do you use it academically? I just incorporate it inot my poetry. Music and visual art tie right in for them. Margarita, I meant, what’s the subject you’re teaching, & how does PP help with that? As part of our poetry unit, it demonstrates alliteration, rhyme, imagery, as well as other elements. I made a PPT to coincide with the song. We then do the same with other poems as a way to kindly explicate them It helps students truly understand poems in a deeper way. It’s also a lot of fun. Another activity they enjoy is poetry poker. Both activities sort of liberate students and encourage their own creativity. Middle school language arts can be brutal, so I try to make it fun and interactive. You rock. Gruesome stuff really works at that age too- I still remember the poem “Bishop Hatto,” wherein he’s righteously eaten by rats. Bless Tina for celebrating The Teacher! Good thing you didn’t sing the wrong two of mine or you’d of been sent to the Inquisition. Tom Lehrer is a highly regarded favorite of moi’s. An outstanding share! I’ve just forwarded this onto a coworker who had been doing a little research on this. And he actually bought me lunch due to the fact that I discovered it for him… lol. So allow me to reword this…. Thank YOU for the meal!! But yeah, thanks for spending the time to talk about this topic here on your website.